A call to Fraser Yachts confirms that Flavio Constantino has listed the new 30.4m flybridge motor yacht Morning Star for sale. A Ferretti Custom Line yacht delivered in 2013 and built to RINA class and MCA compliance, she offers accommodation for 12 guests in a main-deck master suite, two VIP staterooms and two twin cabins with Pullman berths. 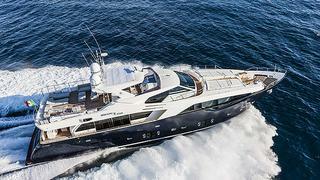 Twin 2,369hp MTU engines give her a cruising speed of 24 knots. Morning Star is asking $13.5 million.